Prince Harry has never been quiet about his desire to settle down and start a family. As far back as 2004, when Harry spent his gap year working at an orphanage in Lesotho, he proved to the world that he was more than just a ‘party prince’; he was a natural with children. In the years that followed, Harry grew into his role as a senior member of the Royal Family, and quickly became one of Brit… ain’s most eligible bachelors. But who would be the woman to win the prince’s heart? Eligible though he might be, embarking on a relationship with Harry came with its own perils. Media intrusion, public scrutiny and the pressures of royal life were a high price to pay for love – too high for some. In late 2016, however, Harry’s romance with Meghan Markle was confirmed. In Meghan, Harry had found a kindred spirit; the actress was a passionate humanitarian and sought to build the kind of family of which Harry had always dreamed. Over the following pages, trace the roots of this unlikely love story, from their childhoods and formative years, to the blind date that started their romance. 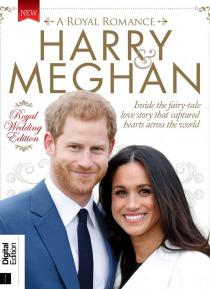 Discover how their love blossomed in secret, and how Meghan will carve her own niche within the Royal Family.